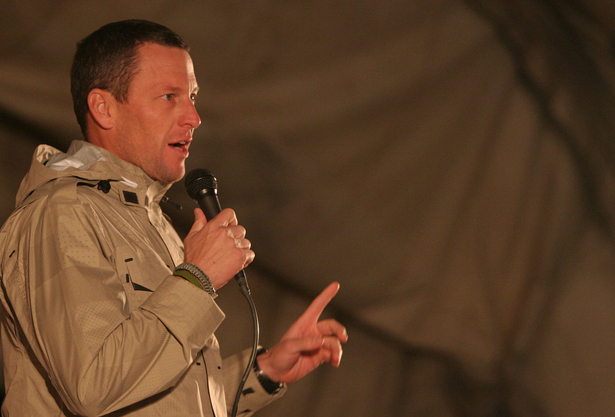 Lance Armstrong will attempt the impossible comeback this week. Given the masters he must appease, Oprah will not be enough. This week Lance Armstrong, our most famous cyclist/cancer survivor/suspected Performance Enhancing Drug user, aims to do something more daunting than ride a bike up the face of the Pyrenees. He is attempting to ride Oprah’s couch back into the good grace of public opinion. On Monday night, Armstrong will, after fifteen years of strenuous, Sherman-esque denials, “come clean” and admit to imbibing illegal “performance enhancers” during his record-setting career. This will not go well—and not only because the broadcast will have already been leaked, dissected and thoroughly flambéed before it airs Thursday night. If Armstrong were only trying to win back the public support he’s lost since the United States Anti-Doping Agency stripped him of his seven Tour de France titles, that could prove challenging enough. But he is attempting the public relations of equivalent of riding his bike through the eye of a needle. Armstrong needs to demonstrate to USADA that he is now, according to reports, on a “path to redemption”. This interview is meant to encourage USADA to lift their lifetime ban on Armstrong’s competitive career and allow him to enter triathlons as well as other events under USADA’s umbrella. But that’s not all. Armstrong needs to look like he’s playing ball with USADA while also gently challenging the most damning sections of their lengthy report on his performance enhancing drug use. Their expose, put together with numerous eye-witnesses over the course of years and at a public cost of millions of dollars, makes him sound like less of a run-of-the-mill PED user and more like Joe Pesci on a ten-speed. They paint the fallen icon as a bullying, intimidating and threatening presence who compelled other competitors to use PEDs and aimed to bribe or scare off anyone who attempted to challenge his cycling empire. And by the way, Armstrong is also seeking to rebuild his cancer foundation, Livestrong, which has taken a massive public relations hit since USADA’s lifetime ban compelled him to resign from the board. Armstrong needs to figure out a way to deny this part of USADA’s report while also demonstrating repentance in order to extract a modicum of mercy from the anti-drug agency. At the same time, if he opens up too much about what went on behind closed doors, Armstrong could also expose himself to an absolute Macy’s Thanksgiving Day Parade of lawsuits. He’s already being sued by the London Sunday Times which is aiming to recover $500,000 it was ordered to pay him in a libel case concerning his PED use. He’s also facing a federal whistle-blower lawsuit issued by former teammate Floyd Landis, who was also stripped of his own 2006 Tour de France for PEDs. (The sport really does make Las Vegas look like Salt Lake City.) Landis claims that Armstrong’s attorneys tried to intimidate him into silence after he accused his former friend and teammate of using PEDs. The Justice Department will surely be watching the Oprah interview as they assess whether to enter the fray, back Landis’s lawsuit and attempt to get back the $30 million the US Postal Service spent in sponsoring Armstrong’s team. If that wasn’t challenging enough, Armstrong is also, according to USA Today, trying to mend fences with Landis in hopes that he will drop the suit. If Ms. Winfrey pushes on this relationship, Armstrong will probably demur gently, which will anger USADA. If he expresses that salty side of himself, he will invite more lawsuits. Whatever you feel about Lance Armstrong, he finds himself in a waking nightmare. If only the leaders of the financial crisis and those who orchestrate the Pentagon’s torture and drone program could find themselves in a similar tsunami of attention, condemnation and legal proctology. Oprah Winfrey recently wrote a positively Oprah-esque, goopy column titled “What I Wish I Knew At 21.” In this piece of cavity-inducing wisdom, Oprah wrote, “The older I get, the less I worry about anything. I can see life unfolding in divine order. And even in times of the greatest turmoil, I can stop, get still, and see with utter clarity: This, too, shall pass.” Lance Armstrong doesn’t have the luxury of that perspective. This shall not pass no matter what he says this week. But it could get one whole hell of a lot worse. Baseball’s (reputed) performance-enhancing drug users are also stuck in a media vortex. Read Dave Zirin’s take on the Hall of Fame vote that wasn’t.